The small sensor connects to an embeddable wireless transmitter that lies on top of the skull. CHAMPAIGN, Ill. — A new class of small, thin electronic sensors can monitor temperature and pressure within the skull – crucial health parameters after a brain injury or surgery – then melt away when they are no longer needed, eliminating the need for additional surgery to remove the monitors and reducing the risk of infection and hemorrhage. Similar sensors can be adapted for postoperative monitoring in other body systems as well, the researchers say. Led by John A. Rogers, a professor of materials science and engineering at the University of Illinois at Urbana-Champaign, and Wilson Ray, a professor of neurological surgery at the Washington University School of Medicine in St. Louis, the researchers published their work in the journal Nature. Illinois professor John A. Rogers led a group that developed tiny implantable sensors for monitoring pressure and temperature inside the skull after a brain injury. After a traumatic brain injury or brain surgery, it is crucial to monitor the patient for swelling and pressure on the brain. Current monitoring technology is bulky and invasive, Rogers said, and the wires restrict the patent’s movement and hamper physical therapy as they recover. Because they require continuous, hard-wired access into the head, such implants also carry the risk of allergic reactions, infection and hemorrhage, and even could exacerbate the inflammation they are meant to monitor. The new devices incorporate dissolvable silicon technology developed by Rogers’ group at the U. of I. The sensors, smaller than a grain of rice, are built on extremely thin sheets of silicon – which are naturally biodegradable – that are configured to function normally for a few weeks, then dissolve away, completely and harmlessly, in the body’s own fluids. Rogers’ group teamed with Illinois materials science and engineering professor Paul V. Braun to make the silicon platforms sensitive to clinically relevant pressure levels in the intracranial fluid surrounding the brain. They also added a tiny temperature sensor and connected it to a wireless transmitter roughly the size of a postage stamp, implanted under the skin but on top of the skull. A downloadable image gallery is available. The Illinois group worked with clinical experts in traumatic brain injury at Washington University to implant the sensors in rats, testing for performance and biocompatibility. They found that the temperature and pressure readings from the dissolvable sensors matched conventional monitoring devices for accuracy. 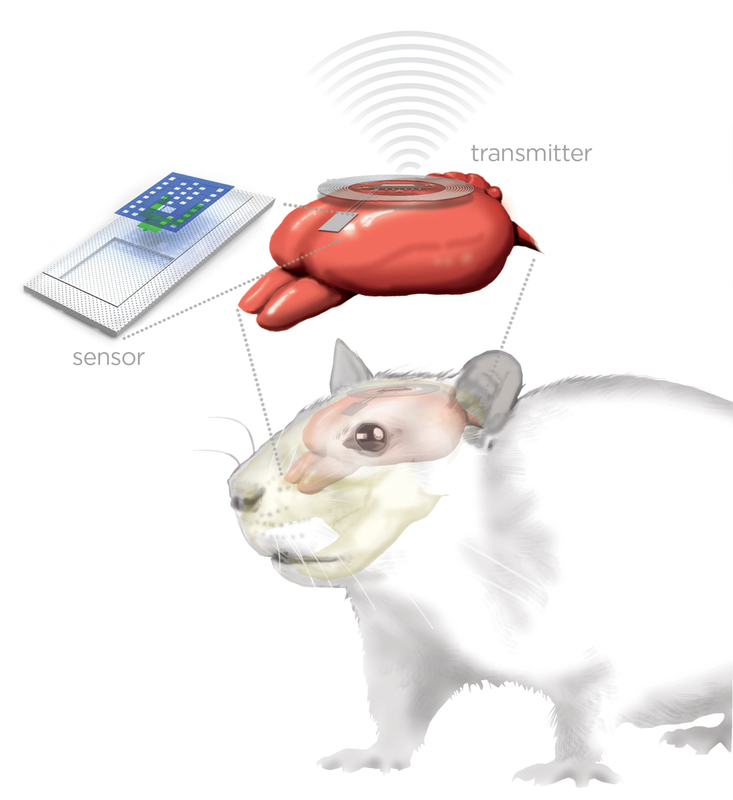 An artist’s rendering of the brain sensor and wireless transmitter monitoring a rat’s brain. The researchers are moving toward human trials for this technology, as well as extending its functionality for other biomedical applications. The National Institutes of Health, the Defense Advanced Research Projects Agency and the Howard Hughes Medical Institute supported this work. 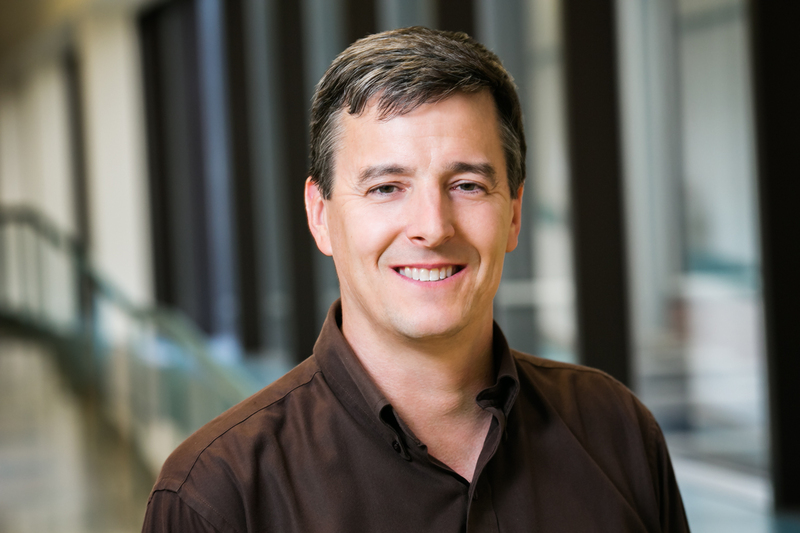 Rogers and Braun are affiliated with the Beckman Institute for Advanced Science and Technology at the U. of I.
Editor’s notes: To reach John Rogers, call 217-244-4979; email jrogers@illinois.edu. 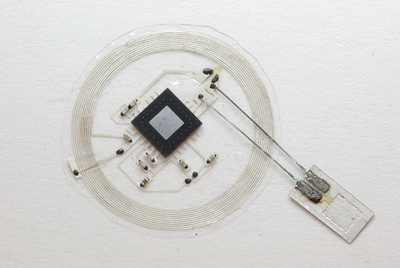 The paper “Bioresorbable silicon electronic sensors for the brain” is available online.